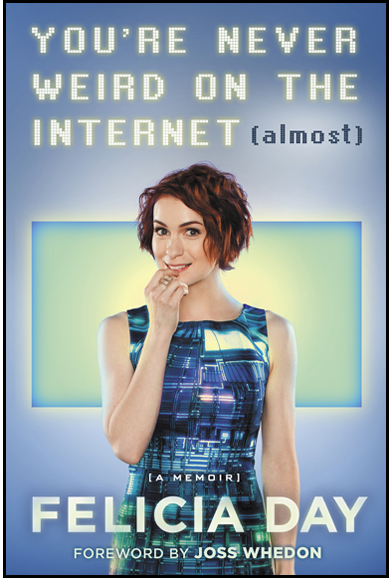 It's a fair bet that most of the people who read You're Never Weird On The Internet (Almost) will find themselves nodding along at least once as Felicia Day pours out the details of her life. From her formative years as a home-schooled hippie-kid who didn't fit in with the rest of the "Thumper" children to her more recent adventures as an advocate for geek girl empowerment in the face of the Gamergate movement, there are many moments that are sure to elicit sympathy from the reader. In my case, it went a bit further than that. I found myself reading this book as if reading a concurrent history of my own warped adolescence. I'm certain it will surprise no one to learn that, like Felicia, I was a bright child who was nowhere near as well-developed socially as I was intellectually and I didn't peak until well into adulthood. Like Felicia, I found the friends I couldn't find in real life on-line. We both role-played on Prodigy, though I was into Quest For Glory and she was into Ultima. We both ran up huge phone bills we tried to hide from our parents - her by calling computer-game hint-lines and me by dialing-up out-of-state bulletin-boards to download Mystery Science Theater 3000 sound clips. We both volunteered at the library and we both showed up to the one high-school dance we ever attended dressed-up fancy for an event where everyone else was in t-shirts and jeans. But it goes deeper than a series of shared experiences. I've also known the pain of depression and anxiety. I also respond more strongly to negative commentary than positive reinforcement because it's a better fuel for my passion. And while I haven't experienced nearly as much vitriol as Felicia has from on-line trolls, I also keep a folder of hate e-mail to remind myself, when I doubt the power of my work, that the fact that I am working at all pisses somebody off enough to try and make me stop. Maybe I'm weird for relating to this book as strongly as I did. But that is Day's point in a nutshell. We, in our own little ways, are all a little bit weird. But weirdness isn't a weakness - it's a strength. It's that little bit of uniqueness that let's us bring something into the world that nobody else can. That message alone makes this book worth the reading. Even if you never fantasized about being an orphan because orphans had all the best adventures in kids' stories and comic books or cringed in agony as your mother found your hidden fan-fiction journal. Felicia, if you read this, thank you. Thank you for opening yourself up with this book. And for trying to make the rest of us realize that we can make ourselves great because of our weirdness - not in spite of it.